Brunch in NYC is a BIG deal. I just returned from my second brunch this weekend, but before I headed out for the afternoon meals, I cheated with breakfast beforehand. Pancakes, french toast, sausages, home fries, and eggs – there’s no denying that brunch food is delicious and no reason you have to leave the cheffing to someone else. Everything comes easily once you master one skill – omelettes. Omelettes are simple, it just takes a bit of practice to know the right temperature for the pan. You want the egg to cook slowly, without bubbling or browning, so you must learn to adjust the heat to slow it down and let everything solidify gently. Practice a bit and you’ll have the perfect dish for one or an impressive dish for two. 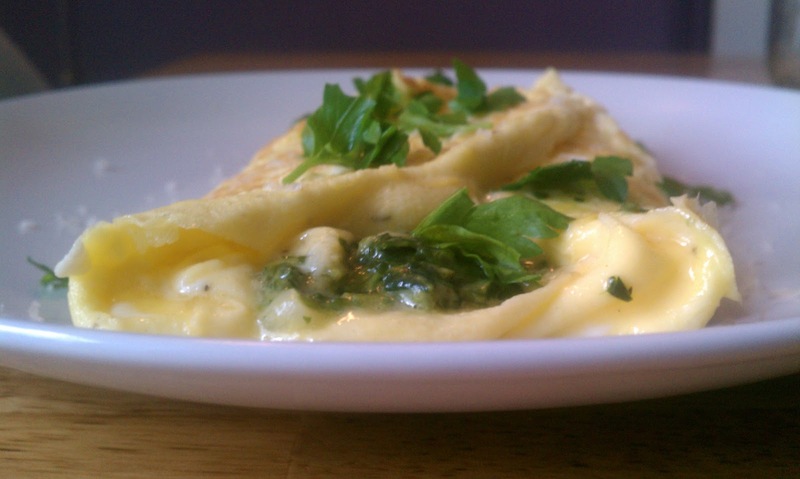 Omelettes are also great for using up random bits of leftover ingredients. A little green pepper and cheddar here, some empanada filling there. Master this basic recipe and you’ll have breakfast for life. If you would like to fill the omelet with cheese, meat, and/or vegetables – I microwaved leftover spinach-parmesan dip – prepare it ahead of time and set aside. Melt butter in the pan on medium heat – be careful that the pan is not too hot. Add eggs, cream and pepper to the bowl. Pick up the bowl and, using fork in a circular motion under and towards you and over and away from you, whisk vigorously for 30 seconds. Be sure to rotate the bowl to mix evenly. When properly whisked, you should see a few large bubbles on the surface of the mixture. Pour the egg into the pan and wipe the bowl with the spatula to make sure it’s all in. Stir egg in the middle and swirl the pan to cover the surface. Using long swipes, move the egg away from the edge of the pan and then lift the pan to swirl more egg mixture along the rim. Continue to push the solidified egg from the edge of the pan toward the center, swirling to coat. When little of the egg remains liquid, use the spatula to help release the egg from the bottom of the pan and give it a shake to release it fully. Add filling to the top of the omelette one-third from the left edge. Fold the left side over the filling with the spatula, then fold the right side on top. Gently shake the pan too loosen, then slip the completed omelet onto a plate. Always garnish with a fresh crack of pepper and fresh herbs. what does the cream do? i’ve heard some tv cooks (and i get what i’m saying there) assert that milk isn’t necessary when cooking eggs. Milk is not necessary – and some cookbooks recommend water for omelettes to help make a light texture – but I love adding cream for the taste. It helps to smooth the taste so it’s not so eggy.